L.A Trip Booked and A Couple Wicked Hotels! 20 Weeks! Half Way There! Up Close and Personal with the Moon Tonight! Me and The MINI at home! Hanson Feat. Weird Al Yankovic! My New Ride! Officially Part of the MINI World!!! Officially a New Home Owner!!! I will say that Europe is ahead of the game in most things, especially when it comes to Induction stoves. This is an amazing luxury that I had to leave behind in my old kitchen. It heats food up by magnetic burners that connect ot the pot from instant hot and boiling water. When you move the pot off of the stove-top, you can actually put your hand right down on it. It will be hot, as the pot was just there - but it won't burn you, as it's just magnetism. Unfortunately, even though we did find a couple of induction stoves here, they were way out of our price range, as it seems very new in North America. 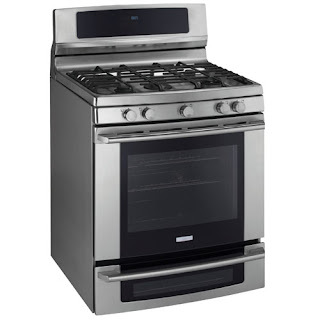 We found a beautiful Electrolux induction oven, but in the end decided to go with the dual-fuel of gas/convection instead. 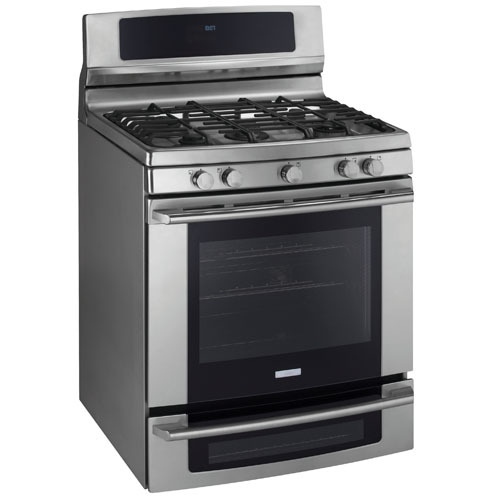 The ovens look very similar, which is a plus, so we eventually went with this one; the Electrolux dual-fuel Wave Touch range. It's awesome because you can also cook on the bottom level (the "drawer" at the bottom functions as a second oven), which I have never had before - and the classic European convection heat is also nice. Electrolux isn't really all that expensive in Norway, but here it seems to be pretty dear. We got a good deal at Sears (in-store is actually cheaper) and I am pretty excited to have some proper dinner parties when we move into the new house!